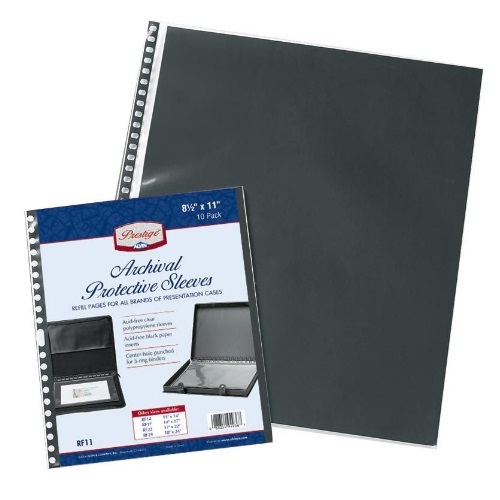 Alvin RF24 - Prestige Archival Protective Sleeve 18" x 24"
Please note: the image shows the 8-1/2" x 11"
Alvin Prestige Archival Protective Sleeve 18" x 24"
Archival quality, acid-free polypropylene material with acid-free black paper inserts. Universal holes allow use in all presentation cases. First dimension is opening edge with holes located along long edge. Alvin RF17 - Prestige Archival Protective Sleeve 14" x 17"
Alvin RF22 - Prestige Archival Protective Sleeve 17" x 22"
Alvin RF11 - Prestige Archival Protective Sleeve 8-1/2" x 11"
Alvin RF11DS - Prestige Archival Protective Sleeve 11" x 17"